Armadillos; the canned dinner of the animal kingdom. While the armadillo may be best known for its protective armor, this is in reality just fraction of this amazing creature's features. First let's take a look at it's illustrious history. When armadillos first came on the scene they were mistakenly believed to be rocks that had come to life. This stigma would be with them for several centuries. When it was discovered that the armadillo was in fact not a rock but a mammal, things changed quickly. Instead of being feared for their legendary ferocity, they were hunted for their delicious meat and their child pleasing helmet bodies. In fact children have long loved the armadillo. Because of this, it was common practice on armadillo ranches of old to give them names like "Dinner" and "Breakfast" to make sure the children always kept boundaries. Classification of the armadillo is often noted by the number of bands. In North America the armadillo of choice is the 9 banded variety. This does not mean if you were to slice one open you would be able to tell its age by the number of rings. In fact it is not recommended you slice of these beloved creatures at all unless making dinner. With a taste similar to pork, armadillo has had several attempts at canning. Though it should be noted that as armadillos can carry leprosy, you should always cook them thoroughly. Armadillos can empty their lungs and the weight of their shells will sink them to the bottom of a body of water or they can expand their lungs and float on top of the water. Truly nature's submarine! Their shells are made of bone. So your dog is guaranteed to love em! Armadillos usually give birth to litters of monozygotic (identical) quadruplets. So if one dies, the next one can pick up where the last left off. Armadillos are excellent diggers and have even been known to burrow down in cemeteries to feast off of the grubs and worms in corpses! So make sure to leave him at home when visiting your great aunt's plot. With the all the latest technology involved in making helmets, armadillo shells can now safely stay in our cupboards for use as cereal bowls. Armadillos have a musty smell that gets worse when they're nervous. Very similar to this kid I knew in the third grade. 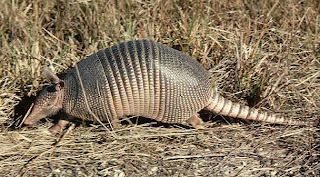 Armadillos are like a drunk riding a plow so watch that they don't get into your gardens. Curls into balls for protection, at which point it can used as a ball. The name is Spanish for "little armored one." Not the brightest, if a car is approaching, it will jump straight into the air, making it an easier target. Yes the it truly is a fantastic creature with fascinating mechanics, a love for being eaten, and eating us. So the next time you see one while driving down the road, I hope you'll take a minute to stop and say hello to the humble but mighty armadillo. Fascinating post about the armadillo. My favorite line is "Armadillos; the canned dinner of the animal kingdom." I love armadillos! Here in Texas, they like to sleep on the side of the road, we see them there all the time. "With the all the latest technology involved in making helmets, armadillo shells can now safely stay in our cupboards for use as cereal bowls." Agreed. Fun facts are great. Yeah I'm going to keep my pet A clear away from my Aunt Gert's final resting place. Love the facts--especially the last one about the car. It's tragic but also funny. No, it's tragic. OK, it's a little funny too. Yes, the next time I see one on the road, I ll stop and say hello. However, due to the fact that I live in Virginia, if I see one on the road, I reserve the right to freak out first. Call the newspapers second. And take pictures third. Then, if there's still time, I'll say hello. Too many great lines in this one to address them all but my fav is, "...armadillo shells can now safely stay in our cupboards for use as cereal bowls." There is an armadillo at our zoo and we are fascinated by the way it scuttles. It is so cute! Sadly, most of the time it is hiding and we can't see it. Wow! I've lived in Texas now for 30 years and knew almost none of those facts...geesh, ya think ya know a state animal and then ya find out ya don't...good stuff tho. So late to this conversation, but did you know you can sneak up on them - they can't see too good, and if you get behind them, you can put string cheese on their backs, which they then smell, and then do a great dance trying to get to. I never did this - if you're with the State Parks and Wildlife or PETA, call my husband. That's an adorable fact to know! I always wanted one as a pet. PETA - People Eating Tasty Animals.